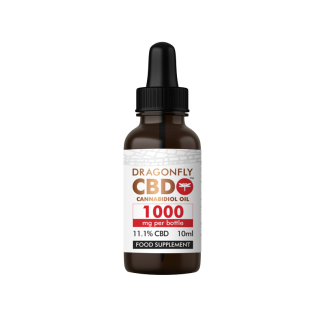 This 1500mg DragonflyCBD™ tincture is a uniquely formulated, narrow-spectrum oil. Unlike our broad-spectrum products, it offers CBD in filtered form, with all other Cannabinoids, terpenes and waxes reduced. This product is not made from CBD isolate. From seed to shelf Dragonfly Biosciences® controls the whole process. Sourced from organically grown Cannabis Sativa L.
Directions: Using pipette, administer oil under the tongue. Hold for 2 minutes to maximise absorption. We recommend starting with a 5 drop (approx. 12.5mg) serving then varying as required. Do not exceed 200mg of CBD per day. Ingredients: Cannabis Sativa L. extract, organic hemp seed oil. Storage: Out of direct sunlight and below 25 degrees. Keep out of reach of children. Warning: You must be at least 18 years old to purchase this product. To be taken as part of a daily routine. This product is not intended to diagnose, treat, cure, or prevent any disease. Based on our recommended 12.5mg serving, this tincture contains approximately 120 servings. How can I take CBD? While there are a number of different ways to take CBD, we generally recommend the sublingual route (holding CBD oil under the tongue before swallowing) to maximise absorption. Other options include topical application (rubbing oil directly onto the skin) for problem areas and oral consumption (directly swallowing/infusing the oil into food). Can it help with X problem? Unfortunately, we can’t give medical advice to our consumers. However, there is a wealth of studies available and we encourage you to do your own research. What are the benefits of taking CBD oil? 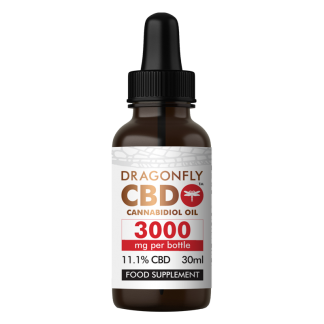 DragonflyCBD is sold as a dietary supplement and we are not liable to make any medical/health claims regarding the products. However, we do encourage your own research; there is a wealth of peer reviewed journals and, increasingly, human clinical trial data, that provide evidence for the benefits of CBD. Does taking CBD cause any side effects? Potential side effects include a dry mouth, lightheadedness and drowsiness. Lowered blood pressure can also be an issue for those whose blood pressure is already low – either naturally or as a result of medication. However, it is worth noting that for many people using CBD, little to no known prominent side effects occur. Those documented are more prominent in studies that use test subjects consuming high doses of CBD (1 gram per dosage in comparison to the maximum 200 mg dosage recommended by Dragonfly Biosciences). In order for Cannabis-derived products to make you high, the psychotropic cannabinoid THC must be present. At Dragonfly, not only do we carefully select Cannabis strains that are low in THC and high in CBD, well also use specialist extraction techniques to reduce THC content to trace amounts. In short, no.